The Pablove Foundation have announced additional performers for their very special Pablove Benefit Show on November 21st at the Avalon in Hollywood. Joining Tom Morello’s The Nightwatchman, Black Rebel Motorcycle Club, Shirley Manson, Butch Walker and Charlotte Martin on stage; will be newly announced performers Band of Horses, Sea Wolf and Songs For Kids. The Pablove Foundation is a non-profit organization founded by Dangerbird Records co-founder Jeff Castelazis. Every year, the Pablove Foundation gives money to improve the lives of children with cancer, at both a national level as well as a local level here in Los Angeles. 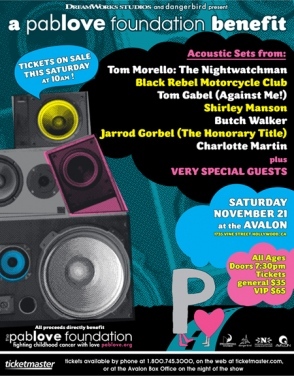 On Saturday, Nov. 21 at the Avalon in Hollywood, the Pablove Foundation will host an awesome benefit concert featuring acoustic sets from Tom Morello, Black Rebel Motorcycle Club, Tom Gabel, Shirley Manson, Butch Walker, Tom Gabel (Against Me! ), Jarrod Gorbel (the Honorary Title) and Charlotte Martin, with other major artists to be announced shortly..
Tickets are $35 (GA) and $65 (VIP) and will go on sale this Saturday, October 31. All proceeds will go to the Foundation. This entry was posted in Uncategorized and tagged aganst me, benefit, Black Rebel Motorcycle Club, cancer, dangerbird records, los angeles, pablove, the honorary title, Tom Morello on October 30, 2009 by Sandra Burciaga Olinger.